To get to the Main Menu while watching live TV on Apple TV press the "Menu" button on the remote. On Android TV and Amazon Fire TV (and Stick) press the "Back" button. The main listing of channels that lets you move forward and backward in time to see what's on. ReplayTV is access in the Guide as well. Browse shows by categories such as "What's on Now", "Action", "Drama", etc. Browse movies by categories in the same way as the Shows section. Manage your DVR Recordings and other settings such as Parental Controls, User Profiles, signing out and other information. Search across the entire app by show, movie, actor, channel and many other options. 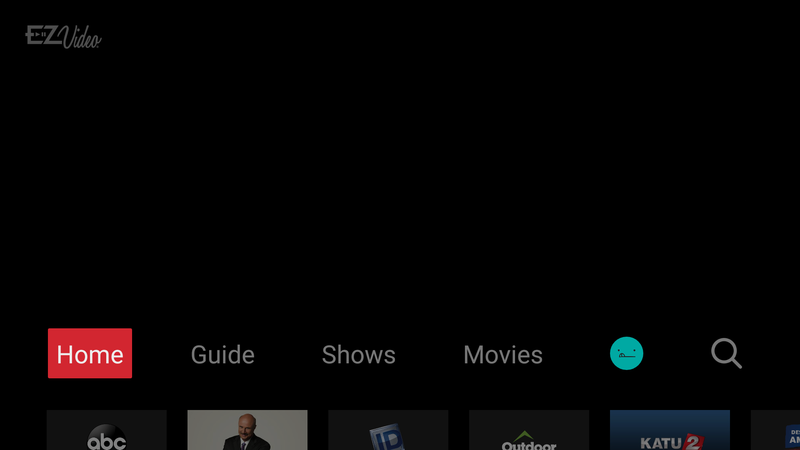 Below the Main Menu is the Recently Watched list which is your history of channels and programs so you can easily go back to a show or movie you were on before. To access the recently watched while in the Main Menu on Apple TV swipe down on the touch pad. On Android TV and Amazon Fire TV press the Down directional button again. Once here you can move right through your history of channels and programs watched. In many cases if the item is a live channel, you will see a picture-in-picture preview of that channel.